Modern design brings a serene warmth to garden and rooms, this Feng shui bamboo fountain can be sit on any bowl or accent to decor you zen garden, home and office. EASY INSTALL: Complete kit is not includes submersible pump,please kindly note. tubing and bamboo fountain.This size fits on the edge of a 10" to 18" diameter container. The three arm design is sturdy and made to last. Fountain support arms can easily raise or lower to control the sound, Hearing the calming sound of running water helps you relax by creating stress-free ambience in just minutes. 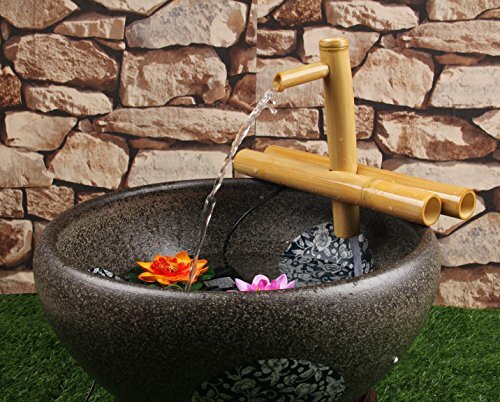 Make up your zen garden or backyard with simple diy fountain, Pick and choose the color bowl you want to create your very own tranquil paradise indoor and outdoor. Each spout is handcrafted from solid bamboo and with the environmentally friendly painting to avoid Bamboo moldy when touch the water for days. MONEY BACK GUARANTEE - If for any reason you are not satisfied with our bamboo water fountain, we will give you 100% Refund without any question. If you have any questions about this product by foci cozi, contact us by completing and submitting the form below. If you are looking for a specif part number, please include it with your message.